My designBoard at work. 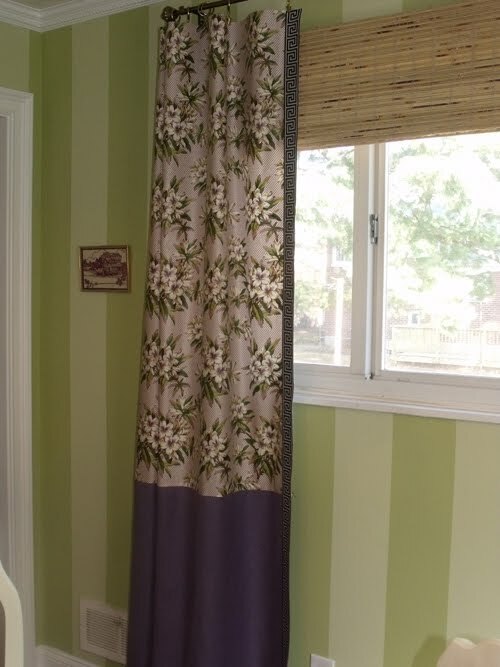 Our dear Azalea has found her place with some accompanying violet linen and the Greek key trim. This is still the original chandelier - have not replaced it with the larger one yet. 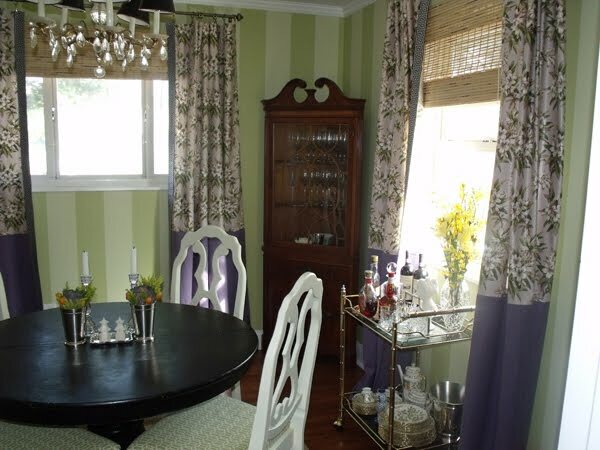 A close up of the window treatments - the drapes I made accompanied by some fabulous bamboo blinds I found on Overstock. We hung the blinds on the outside of the windows (outside mount versus inside mount) so we didn't have to worry about exact measurements and could thus skip having custom blinds made. With the drapes hanging on either end you can't tell that the blinds aren't a perfect match for the window. The little Chinese print I found on eBay hangs on the wall (to be accompanied by other items in the future). The china cabinet, as I've mentioned, was a Craigslist score. I see some glossy black paint in its future. The bar has now moved beneath the second window to make room for my Christmas loot. I like how the light hits all the shiny objects through the window. My Chinese Chippendale pagoda chair in its new corner with the mirror that we found in the house when we bought it. The drapes are currently pooling on the floor awaiting some hemming - I think I might add the Greek key trim to the bottom. The other corner with a fabulous chair I found at Chartreuse and Co. I'm planning to recover its seat and the Chippendale chair's seat using some great vintage fabric I found on Etsy. 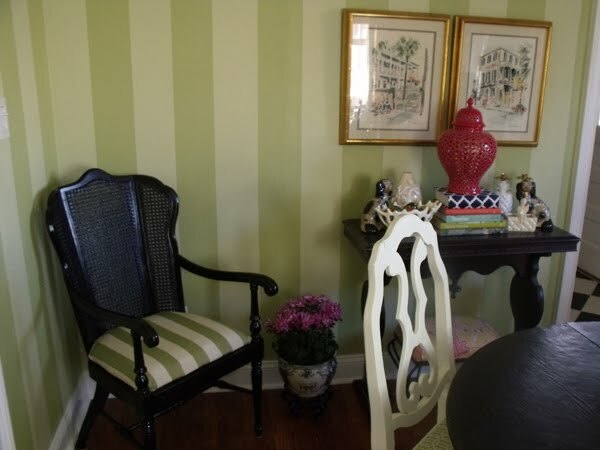 I think the green stripe fabric will move over to recover the footstool underneath the side table. The side table is one of my absolute favorite pieces. It belonged to Carter's great-grandmother. I think it is so unique with its curves and details. The vignette atop it was a bit hastily arranged for Thanksgiving - white ceramic, some candlesticks we picked up in Charleston, the Staffordshire dogs, the coral urn I found at HomeGoods and some of my favorite design books. The prints of Charleston are hand-me-downs from Carter's mom - I love, love, love them. 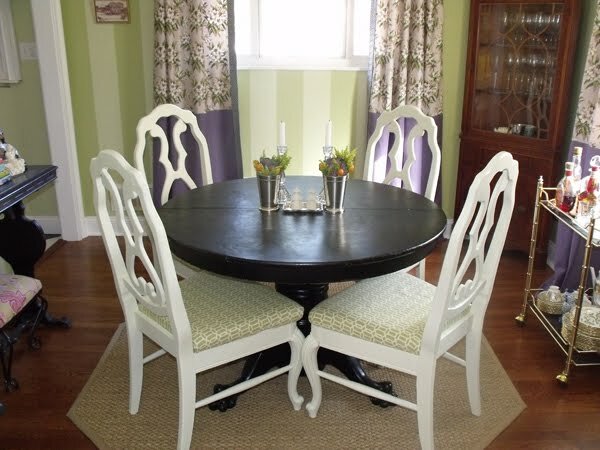 I've mentioned before that the table also belonged to Carter's great-grandmother - we gave it some new life by painting it black and we've been using it as our dining table since we got married. 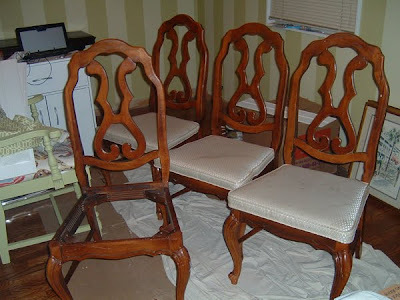 I've also mentioned that the chairs are another Craigslist find - I repainted the set and recovered the seats. I'm thinking the seats need a punchier fabric (can you tell I like punch?). 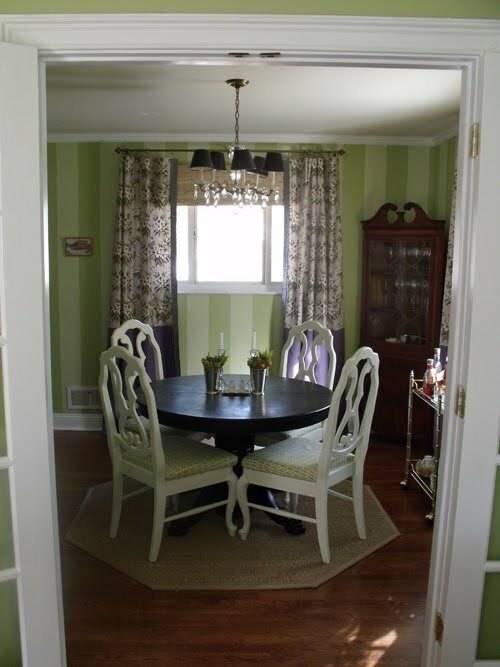 The octagonal rug was a gift from my mom - we found it on HomeDecorators.com. This room has come a LONG way since we moved in, as you can tell from the before picture. 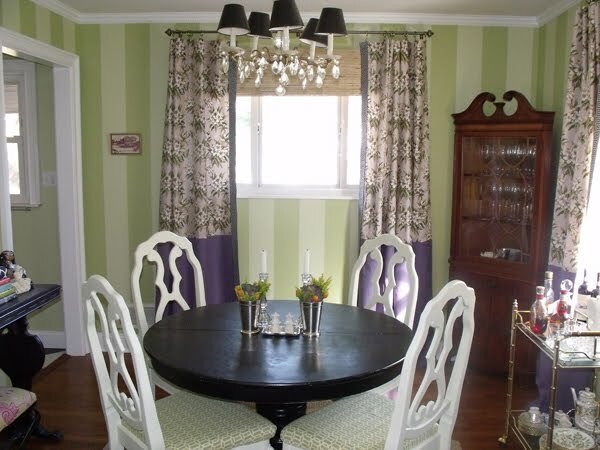 The stripes I painted on the walls were quite a labor of love, but every time I look in the room I'm so happy I plowed through the task. Carter's dad did a great job running the crown molding, and Carter replaced the baseboards and outlets throughout the room to really update it. I still have some projects to tackle, but it feels close to complete. 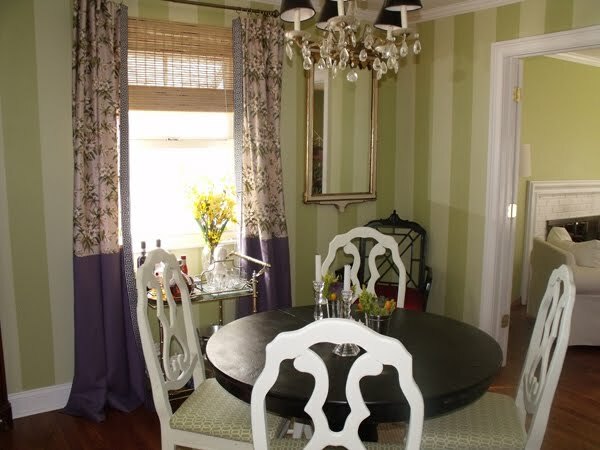 And we loved using it at Thanksgiving...rooms always feel better once you've had friends and family in them. What an amazing transformation. 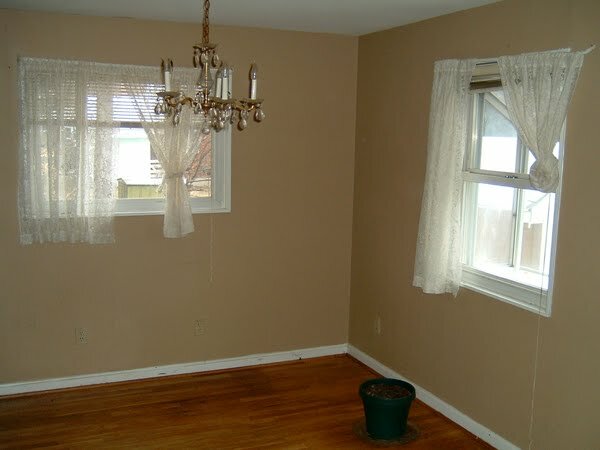 You put so much care into that room -- I can't wait to see how the other rooms develop. Gorgeous!!! I particularly like the planter full of dirt in your "before" picture. Truly, though, this is a beautiful room. It's shameful how long that planter (that came with the house) stayed right there in that exact spot. We obviously didn't even move it for the picture. It does give the picture a nice depressing effect, though...which aids in the contrast with the after. I am absolutely in love with this room! I am amazed at how you brought all of these different pieces together to form perfection. You are truly talented D! Splendid! 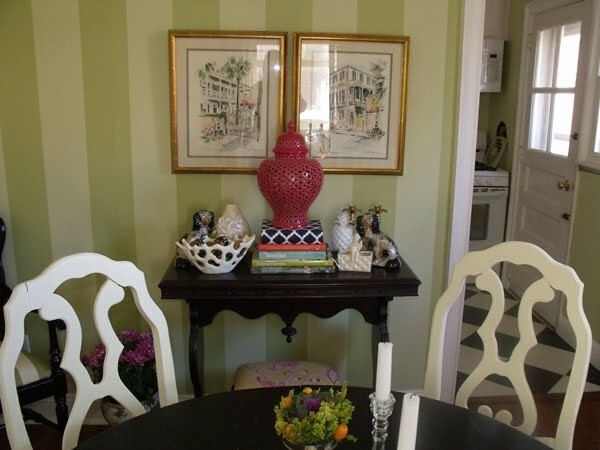 I can't get over the striped walls - every time I see them these days, I want, want, WANT! Love your pierced, red urn from HG - can't wait to make a huge pit stop there when we arrive Stateside later this week! You should be very pleased and proud, it looks fantastic! Thanks MLHP...make sure you bring a big empty suitcase to fill with your HG loot. I am quite pleased...it was all in my head and it's been nice to see it come to life. Thanks for the kind words! A breathtaking transformation! 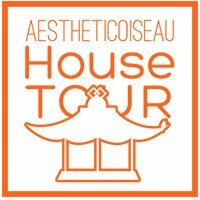 I liked your little blanc de chine pagodas! I love it, D! Especially those FINE crystal candlesticks :) You have done a truly wonderful job and should be very proud. I'm so glad you had a beautiful Thanksgiving! love every single arrengement from your web.